Create an ambiance of true love. 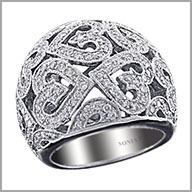 Crafted in polished 14K white gold, this ring features 197 full round cut diamonds in prong settings. The heart dome design shines as it attests to your special love. The total diamond weight is approximately 1.97ct with a color of G-H and a clarity of SI. The setting size is 3/4" x 15/16" with a height of 3/16". It also has an undergallery for added beauty and comfort.